Loftus Christmas Tree Festival this Weekend! The first Loftus Christmas Tree Festival will be held in Saint Leonard’s Parish Church Loftus this Weekend! This weekend Saint Leonard’s Parish Church Loftus is hosting the first-ever Loftus Christmas Tree Festival! 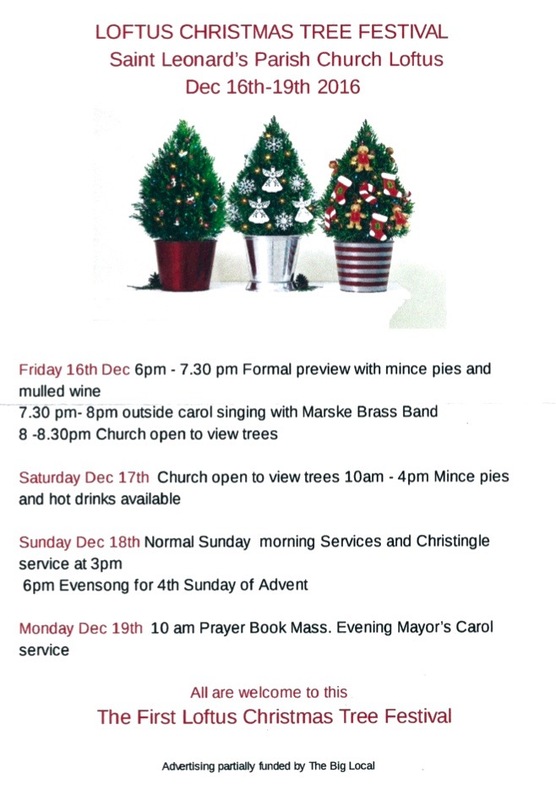 This weekend of events will begin on Friday evening at 6:00 pm with a Preview Event; followed at 7:30 pm with carol singing led by the musicians of Marske Brass Band. On Saturday, Saint Leonard’s Church will be open from 10:00am through to 4:00pm for the public to view the Christmas trees; which will then make a suitable backdrop to our Sunday Services and especially to the annual Christingle Service to be held at 3:00 pm on Sunday afternoon. The festival will then conclude on Monday evening with the Loftus Civic Carol Service at 7:00pm. Everyone is most welcome to attend any, and all, of these events, which are all free of charge! Refreshments will be available on Friday evening and all day on Saturday; and any donations received will go to the up-keep of our wonderful Parish Church.